This short poetry assignment has student focus on word choice, personification, simile and alliteration. In addition, it gets them into the season of winter, as they have to brainstorm vivid vocabulary that describes winter. Included in this assignments are the directions to the assignment and the snowman template. 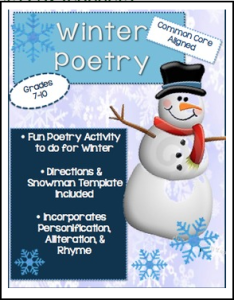 This assignment also gives the students a chance to be creative and decorate their snowman.